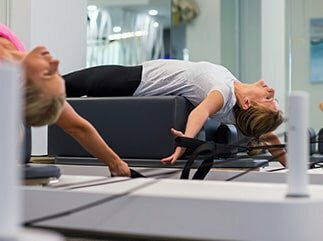 Pilates is a type of exercise that aims to restore full body movement through normal range and strengthens all the major and minor muscle groups in the body in a balanced fashion. It should improve flexibility, strength, balance, posture and body awareness. Technique can focus on the development of core muscles (deep abdominal muscles and pelvic floor muscles) and builds movements for other parts of the body using abdominal control and proper breathing. The quality of movement is initially the most important rather than repetitions or how energetically you can move, hence proper supervisions is paramount. Further progressions can then introduce elements such as speed, endurance, agility, strength and instability. 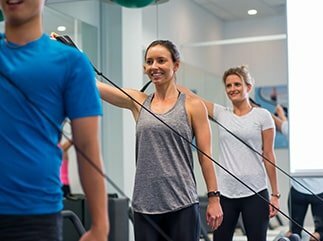 Clinical Pilates led by Physiotherapists is especially effective in the management of pain and injury as it is specifically targeted towards particular injuries. Research has shown Clinical Pilates reduces pain and recurrence in low back and spinal pain. Due to the individual attention, this method can suit everybody from elite athletes to people with limited mobility, pregnant women and people with low fitness levels. Yoga is an ancient Indian philosophy that dates back thousands of years. It was designed as a path to spiritual enlightenment, but in modern times, the physical aspects of Hatha yoga have found huge popularity as a gentle form of exercise and stress management. There are many different varieties of yoga, but each one essentially relies on structured poses (asanas) practiced with breath awareness. Yoga is a renowned antidote to stress. This is because concentrating on the postures and the breath acts as a powerful form of meditation. Each yoga posture, or asana, is held for a period of time and linked with breathing. Pilates is suitable for those who need more toning, stability and range of motion. Particularly with a Physio if there is any underlying pathology as there will be specific exercises that may flare you up and others that will assist you. Yoga is more suitable for those who just need a good stretch out and are generally inflexible. Many postures can take you into extremes of range so beware if you have any musculoskeletal concerns. As Physios, we treat a lot of people with back pain and quite often the rehabilitation required for non-specific back pain is to either increase flexibility or improve muscle tone. After assessing you your Physio should be able to suggest whether your body type would suit Yoga or Pilates more. We of course offer Pilates classes under the guidance of our Physios here at SquareOne.